The richness of biological diversity of the Maldives, among species, within species and between ecosystems, is striking. This is particularly true of marine biodiversity. Hundreds of species of multicoloured tropical fish, in all sizes and shapes, along with an abundance of corals and shells live in the sea and near the reef surrounding every island and reef formation. Though the extent of terrestrial flora and fauna is less rich, it too is nevertheless important within the country's natural resource stocks. Historically, Maldivians have depended upon their country's marine resources for their survival. Tourism and fisheries, the country's two largest earning industries, are based on marine resources. Accordingly, the future economic prosperity of the Maldivian economy is clearly dependent on guaranteeing the sustainability and status of these natural assets. Yet, despite the tremendous importance of these resources, the extent of biological diversity existing in the Maldives, including marine life, flora and fauna, has not been adequately researched or documented. The range of biological diversity in the Maldives is largely confined to a tropical island environment. Some studies have shown that flora and fauna differ between the northern and southern islands. Many species resemble their ancestors from mainland Asia, however, they have evolved through time to adapt to the conditions of the Maldives. One theory holds that most fauna arrived on the archipelago using the Lacadives, as well as the direct drift from the north-easterly monsoon winds, and that the majority of wildlife originated in India and Sri Lanka. It does not, however, discount the possibility of colonisation from Africa given similarities with fauna on the southern islands (Webb, 1988). In terms of flora, the archipelago has a diverse vegetation cover, especially given the existence of poor and infertile soils. The south, particularly islands such as Fuamulaku and Hithadoo, have a richer diversification of plant species than northern islands. 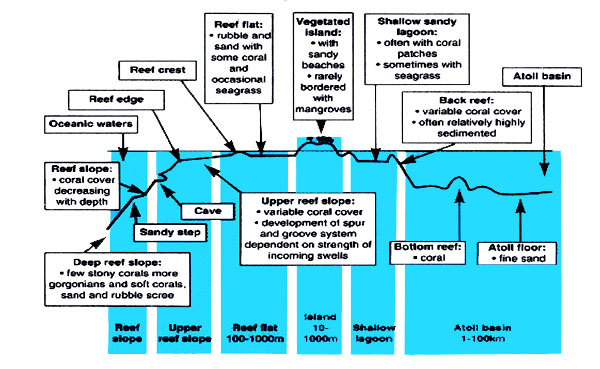 Some of the habitats available for wildlife in the Maldives are illustrated in Figure 3. Compared to the rest of the Indo-Malayan region, the Maldive Islands exhibit a relatively small proportion of representative species, and the archipelago is not associated with an abundant terrestrial wildlife (Webb, 1988). Similarly, the Maldives are relatively poor in terms of terrestrial floral diversity. The 1994 State of the Environment Report records some 583 plant species in the Maldives, of which 55 percent are cultivated species. Over 30 plant species are recognised for their medicinal value and are utilised for traditional medicine practices. A Catalogue of Plants prepared by the Ministry of Fisheries and Agriculture (1992) lists 429 species of plants as illustrated in Table 6 below. The World Conservation Union has recorded 277 local and 450 introduced vascular plants (Davis, Heywood and Hamilton, 1995). In general, most of the plants currently found in the Maldives, both ornamental and agricultural, have been introduced from outside. Source: Ministry of Fisheries and Agriculture, 1992. Traditional farming systems in the Maldives are based on shifting agriculture, polycultural home gardens, agroforestry and taro pits. A diverse range of crops have been cultivated, including cereals, vegetables, fruits, tubers and plantation crops, by farmers (see Box 1 for a overview of agricultural development in the Maldives). Coconut, taros and banana are native to the Maldives, while a large number of different varieties and other crops have been introduced from elsewhere, a reflection of the many external trade and other relationships build up over the centuries. For instance, crops of Indo-Malayan origin, including coconut, banana, breadfruit, taros, citrus, mango and jujube, originated from the Malabar coast of India and Sri Lanka. Pumpkin, watermelon, papaya, custard apple and sweet potato originated from the Americas. Wild stands of coconut exist on all the islands of the Maldives and coconut production remains a dominant agricultural activity. Coconuts and coconut products form an integral part of the Maldivian diet. Coconut timber is widely used for boat-building and construction purposes. The history of agriculture in the Maldives can be gleaned from a number of travelogues, monographs and books, some of which were written a few centuries ago. One of the oldest printed texts on agriculture in the Maldives was documented in the seventeenth century by Pierre Pyrard. According to this account, the Maldivian diet included: 2 varieties of millet grown locally; different types of local roots including 2 yam varieties, and a large variety of fruits such as banana, cucumber, melon, figs and plums. Coconut trees supplied raw materials for wine, honey, sugar, milk, wood, thatch and utensils. Wheat and rice were imported from mainland India and Ceylon. Given problems with rats and mice, houses were built on piles in the sea, 200–300m from the shore, in an attempt to protect grain (Pierre Pyrard). A second account of agriculture in the Maldives dates from the 1920s and was prepared by an archaeologist from Ceylon. This account notes the cultivation of three varieties of fine grains in selected islands only. It also describes the cultivation of vegetables in home gardens, including sweet potatoes, yams, chillies and areca nut (Bells, 1940). Each of these accounts note that land was left fallow for 4–5 years following 2–4 years of cultivation. None, however, discuss crop cycles, multiple crops, methods of manuring or mulching, or labour involved in agricultural activities. More recent studies on agriculture in the Maldives, have documented the cultivation of 5 varieties of grain (millets) using slash and burn agriculture (Maloney, 1980). In addition, one study has documented local varieties of coconut, papaya, banana and eggplant on the basis of their physical appearances and inputs from local people (Arora, 1984). Banana, eggplant, chillies and pumpkin are grown in home gardens on Kela Island, while millet, papaya, sweet potato, tapioca, etc. are cultivated in agricultural plots. Most of the domesticated plants are cultivated on good soil areas that lie between residential areas and foreshore vegetation. These foreshore sandy soils often contain some of the naturalised types of cultivated plants, as well as wild variations of cultivated plants. Agricultural development in the Maldive Islands has long been impeded by the existence of a formidable array of constraints. These include poor soils with a high pH content, limited water supply, scarcity of land5 and uneven distribution of suitable land, rudimentary farming practices and unavailability of a scheduled inter-island transport system within the country. Nevertheless, in the recent past, agriculture occupied an important place in the Maldives, and continues to be important on the atolls. Nowadays, this importance is declining due to changes in food habits and new opportunities to earn higher incomes in other sectors. Forests of psonia grandis are believed to have covered much of the Maldives before clearance occurred for settlement and agriculture. Today, a large variety of local timber species are grown for domestic consumption. These species represent an important part of the islands' biological diversity. Timber trees are also of economic importance to the occupational livelihoods pursued by island communities. Timber continues to be the main material used in dhoni6 construction, a vital activity in this island nation. Artificial materials like fibreglass are not widely used by Maldivians for boat construction. Timber is also used for the construction of houses, as well as for handicrafts and firewood. Table 7 illustrates some of the uses of different timber species. Almost each one of the 1 200 islands making up the Maldives archipelago has some area under mangroves. Not surprisingly, therefore, mangroves are important to the atolls' populations and are used for a range of productive purposes (see Box 2). While some small-scale surveys of mangrove resources on individual islands have been carried out7, a national survey does not exist. Given the existence of various threats to the future sustainability of mangroves in the Maldives, a nationwide survey of the country's mangrove resources is urgently required, and steps should be undertaken to better manage mangrove resource. 5 The total land area of the Maldives is 298 sq. km, of which only about 10 percent is suitable for the plantation of crops. 6 Locally built boats used for fishing or inter-island transport. 7 Thirteen different species of mangroves have been reported from the thirteen islands in the central atolls (Untawale and Jagtap, 1991), while 8 species have been identified on the 5 islands of the North and Central Atolls (Choudhury 1993). Increasingly, most of the timber species preferred by Maldivians are becoming scarce. Indeed, the bulk of timber required for dhoni and house construction must now be imported. In response, the Government's “Million Tree Programme” seeks to highlight the importance of, and expand, good timber stock. Under this programme, the Ministry of Fisheries and Agriculture is engaged in a national plantation effort as well as the distribution of various tree species with food and timber value. In addition, the planting of casuarina trees to act as wind-breakers or shelter-belts to protect plants from the damaging effects of sea spray and to provide firewood is also being promoted by the MoFA (Official Government Website). The Ministry is also taking necessary steps to plant bamboo seedlings in selected areas in an attempt to meet timber demand for poles for pole and line fishing. Mangrove stands are either localised in small depressions in the islands or are along the lagoons. In the case of the depression-oriented mangroves which appear to lack any visible connection to saline water, it is assumed that the effect of the saline water percolating into the depression through the sand during spring tides, ensures adequate inundation for the forest. Mangrove timber is used for boat building, fencing8, fuel and poles, and in the dyeing of fish lines. The Ministry of Fisheries and Agriculture issues tree felling permits, for a fee, through the Island Chief. There is, however, no mechanism to monitor the size of the tree felled. Consequently, practice indicates that the best trees are cut, to the detriment of the mangrove stands. Fruits of two mangrove species, Sonerratia caseolaris and Brugueira cylindrica, are edible. Fire wood is free of cost. Despite their economic value, mangrove forests in the Maldives are not large enough to be managed or commercially harvested. Additionally, some practices are damaging to the sustainable future of the Maldives' mangrove resources. For instance, the wooden nails used in boat building are made of Pemphis. Branches of 1.5 inch diameter are cut off to chisel out these nails; however, most often young branches are cut, leaving only older branches which contributes to poor regrowth. Mangrove land continues to be used for the disposal of garbage, of both organic and inorganic origin, which is likely to cause long-term damage (Choudhury 1993). Most mangrove patches are overstocked and require judicious thinning and pruning in order to revitalise the forest. Clearfelling of old trees may provide some space for younger plants to grow. People on the atolls are generally aware of mangrove resources. For instance, during one research visit9 to a village, all the respondents interviewed, with the exception of girls under 12 years, were able to correctly identify a Bruguiera variety. Several instances are known where people have planted mangroves. For instance, during the 1950s, Bruguiera cylindrica were planted on Kaashidoo Island, in an attempt to combat a future famine situation. The Maldives has a rich tradition of local medicinal practices. Many of the plants growing locally are used in the preparation of medicines. Plant derivatives are also used as pest repellents to protect crops. Though traditional forms of medicine have not been completely documented, some 122 species of plants with medicinal properties were recorded by the MoFA in 1992. Some of the plants used in medicinal practices are presented in Table 8. 8 In particular, lumnitzera poles are used as fences for agricultural plots. 9 Research visits to various atolls were carried out by the author during 1998. 10 Bunches of frangipani flowers are kept inside houses to keep away rats. While a complete study on the ornithology of the Maldives does not exist, some information on the distribution and status of certain species has been complied by foreign and local researchers. Some 180–200 different species of seabirds, shorebirds and land birds have been identified (Zuhair, 1997). Nevertheless, the extent of terrestrial birds is minimal compared to other tropical islands and most of them have probably been introduced (Zuhair, 1997). With the exception of some seabirds, very few of the identified bird species reside in the Maldives. Most are seasonal visitors, migrants, vagrants or introductions, or have been imported as pets. More than 70 different species of shore birds have been observed. Seabirds are widely observed throughout the islands. At least 40–50 seabird species have been observed in Maldivian waters, though only 13–15 of these are known to nest and breed locally11. Seabirds are extremely important to local communities, especially for their value to fishermen. For instance, tuna schools chase small fish and other marine life such as shrimp to the water's surface where they are preyed upon by several species of seabirds. These seabirds flocks are therefore important an indicator to fishermen of the presence of tuna schools. Indeed, it has been estimated that as much of as 90 percent of tuna schools are located in this manner (Anderson, 1996). Serious concern has been expressed regarding the survival of these endemic bat subspecies in the Maldives, and calls have been made for an assessment of their status and conservation (Action Plan for the Conservation of Old World Fruit Bats, IUCN). In 1993, bat species existing on the Maldives' southern and central atolls were surveyed13, following which a recommendation was made to prepare a Conservation Management Policy and Plan (Holmes, 1993). More than 130 species of insects, including arachnids, flies and ants, have been recorded (Holmes, 1993). Spiders, in particular, appear to be rich in diversity. In addition, more than 67 butterfly species have been identified, and other species including scorpions, centipedes, paper wasps and rhinoceros beetle have been observed throughout the archipelago (Webb, 1988). 11 These include terns Sterna sumatrana, S. albifrons, S. anaethetus, S. dauglli, S. bergi, S. bengalensis, and S. fuscata, S. saundersi, two species of noddies Anous stolidus and A. tenuirostris, and the white tern Gygis alba monte known to breed only on Addu Atoll (Anderson, 1996). Other bird species, including frigate birds, white-tailed tropic birds, boobies and some shearwaters, are also known to breed in the Maldives (Shafeeg, 1993). 12 It has only one record, from Addu Atoll. 13 This survey was carried out in November 1993 by the Chiroptera Specialist Group of the Species Survival Commission, together with the Bat Conservation Trust. 2 gecko species are commonly seen throughout the country. Box 3: Bats in the Maldives - Biodiversity's Friends or Farmers' Foes? Bats are vital for seed dispersal and pollination in tropical forests. Several plants in the Maldives, such as Barringtonia14 flowers, exhibit all the characteristics of a bat-pollination. Bats have been seen feeding on the fruits of various wild food plants, including Pandanus, Sonneratia, Ficus, Morinda, Cocus and Pisonia, in addition to the flowers of Barringtonia and Cordia. They have also been reported to drink from the collecting cups placed in coconut trees by toddy-tappers. In some cases, villagers regard bats positively. For instance, on Addu Atoll locals believe that by licking the congealed drops of sap on tapped flower stalks, bats enhanced sap flow. In most cases, however, bats are regarded as pests that damage plants and crops. For instance, they are perceived as a problem for the cultivation of star fruit, bread fruit, mango, papaya, banana, guava, stone apple, water apple, ‘jeymu’, betel nut and custard apple. In the southern islands, where commercial horticulture is undertaken, bats are believed to create severe problems; however, they are not usually killed by farmers. Bats have also been accused of eating small fruits, though local knowledge suggests that this is usually following initial damage by rats. One study has reported that measures are being undertaken to control bats in order to limit their damage to food crops (Dolbeer, Fiedler and Rasheed, 1988). In contrast to the relatively impoverished terrestrial biological diversity in the Maldives, marine biological diversity exhibits outstanding richness. Indeed, the marine biodiversity of the archipelago is among the richest in the entire region, and the Maldives' has been recognised as having one of the world's most diverse marine ecosystems. The Maldivian reefs have been described as bursting with a variety of lesser creatures whose sheer numbers defy description (Webb, 1988). More than 250 different species of hermatypic corals exist, belonging to 41 genera from the north and 55 from the south. Over 1 200 reef fish species have been recorded15 (Pernetta, 1993). As many as 5 000 different shell species, 100–200 sponge species, more than 1 000 species of marine crustaceans and over 100 species of echinoderms exist. A large range of different types of marine algae16 have also been documented (Pernetta, 1993). In addition, a variety of sharks, eels, rays, dolphins, whales and aquarium fish are commonly observed throughout the archipelago. Five species of endangered turtles, namely loggerhead turtles, green turtles, hawksbill turtles, olive ridley turtles and leatherback turtles, are also know to live in Maldivian waters (Frazier and Frazier, 1987). 14 An important timber tree. In particular, the stems are used for making boat prows. 15 For further information see the pictorial guide to selected reef fish and corals of the Maldives (Anderson and Hafiz, 1989). 16 Including some 21 species of Cyanophyceae (blue-green), 163 Rhodophyceae (red), 83 Chlorophyceae (green) and 18 Phaeophyceae (brown). A recent research study, carried out by the Marine Research Section (MRS) of the Ministry of Fisheries and Agriculture, has documented economically important fish species in the Maldives. Some 900 species have been identified, nearly 300 of which were completely new records for the Maldives, and 7 of which had never before been recorded anywhere in the world17. A second study records some 899 species of pelagic and shore fish, including 201 records new to the Maldives (Randall and Anderson 1993). Fishing for reef fish has gained popularity in recent years with the increase in tourism, and new markets have been found on the resort islands and in Male'. In previous times, reef fish were only harvested when tuna was in scarce supply. Now, 45 species of reef fish are commercially important and salted and sun-fried reef fish are exported. Shark fishing, traditionally important to Maldivians, provides another source of export revenues (see Table 10 for a list of commercially important shark species). Reef sharks are caught for their flesh, while deep water sharks are caught for their high quality liver oil. The following table presents the six main shark types of commercial importance in the Maldives. 17 The results of this study are documented in four illustrated volumes entitled “Catalogue of Fishes of the Maldives”. In recent years, the volume of total fish catch harvested by French and Spanish ships operating from the Seychelles has fallen from 50 percent to 10 percent of the total catch in the Indian Ocean. This large drop does not, however, mean that the per capita fish catch has decreased. Rather, it could indicate overharvesting of the fish stock. Marine assets in the Maldives also include giant clam and bec-de-mer which are commercially important. A giant clam fishery was started in the Maldives in 1990; however, a 1991 survey of clam resources indicated that overfishing at the present rate would destroy the industry. Harvesting giant clams was banned in 1996. A bec-de-mer fishery, begun in 1985, initially achieved good results until the value of dried bec-de-mer dropped in 1998. This fall in price was due to the smaller size of the catch and unpalatable species. Bec-de-mer is now protected by restrictions on the type of species which can be harvested and on the size of harvest, and the collection of bec-de-mer by scuba divers is banned in an attempt to save stocks. A research programme on the culture of giant clams, sea cucumber and seaweed is currently being undertaken.